My interest in the journals of Lieutenant George Woodberry of the 18th Hussars was initially pricked by contact from a good friend of mine, Colin Yorke, who had previously worked with me on the publication of the Journal of Ensign John Drummond of the Coldstream Guards. He informed me that he had obtained a copy of Woodberry’s journal held by the National Army Museum in Chelsea, which covers the period from January to September 1813 only. I was already aware that excerpts of Woodberry’s journal had been previously used by Eric Hunt in his book Charging Against Napoleon but on further investigation I became really intrigued when I realised that the journals of George Woodberry had only ever been published fully in 1896 by Georges Helie in French! The French version also interestingly covered a much greater expanse of time, covering George’s service from January 1813 right up until July 1815. Even more extraordinary was the discovery that the French version of early 1813, which covered the same period as the handwritten journal held by the National Army Museum, differed significantly in their content; not in the basic facts thankfully, but in the finer detail, each making mention of certain aspects which were not duplicated in the other with some dates also omitted in the French version. These idiosyncracies had also been noted by Peter Hicks, a British professor who works with the Fondation Napoleon, who republished Woodberry’s account, having added in the missing dates from the British version, but again only published in French. The handwriting in the English journal has been compared with the image of the one page we have of the notebook containing Woodberry’s account as used in the French version by Heli. It is certainly identical, so why were there two versions of the same journal? By now, my interest was definitely piqued and I decided to work with Colin on publishing the entire Woodberry journals for the very first time in English. This is the result, which I trust that the reader will find is an invaluable primary source on the life of a young hussar officer in Wellington’s army, one which has for far too long been largely ignored in the Anglo-Saxon world simply because it was only available in the French language. Unfortunately, all records of the whereabouts of the journals Georges Helie was able to view and translate are now lost, but clearly, they were in France and with that country having suffered much in two World Wars, it has to be presumed that the original journals no longer exist. George’s handwriting style is very fluid and quite neat in comparison with many of the scrawls the editor has had to grapple with previously. It is written by someone who was not only highly educated, but Woodberry was clearly a gifted writer and story teller and although he starts writing the daily journal reluctantly, it is clear that it soon became a source of comfort to him and was no longer a chore. There is some possibility that George may have preserved the journals with a view to publication, but if so it never came to fruition in his lifetime and there is thankfully no real evidence of wholesale amendments at a later period. The journal entries are fresh and uncluttered with the dreaded hindsight; humorous but also devastatingly blunt and honest at times; often providing the unvarnished truth as he saw it and he was also an incorrigible rumour monger! In all, his journals are fascinating, scandalous and entertaining all at once, whilst the editor has found evidence to back up every statement he makes, even down to the British officers accused of cowardice at Waterloo, who were quietly persuaded to resign their commissions instead of causing great embarrassment by having to hold court martials weeks after the greatest victory of the British Army. It must also be said, that George Woodberry is throughout, an enigmatic figure, his family, even his birth and death are still shrouded with some mystery, but a great deal of investigation work carried out by Colin, myself and the contacts we have managed to develop in Venezuela, have now answered most of the questions about his life, although frustratingly a number of gaps do still remain. If the publication of his journals leads to any further discoveries regarding the life and death of George Woodberry, the editor would gratefully receive such information via the publishers. George Woodberry states that he was born on 13 April 1792 and he makes it clear that he viewed Worcester as his home. Utilising these few scraps of information at our disposal, it is almost certain that he hailed from the Woodberry family which resided in the ecclesiastical parish of Claines. His grandfather (also a George) was baptised at Pershore near Worcester and married Hannah Mills at Claines on 22 January 1760. Our George was the son of the next generation of George Woodberry’s who married his mother Maria (nee Pitman), in Claines on 18 July 1786. Two baptisms can be found in Claines for their children, William on 1 May 1787 and Elizabeth on 25 January 1791, there are however no records of a baptism for our George in 1792. It is also unclear how the family made its money, as there are no records of commercial enterprises, deeds or wills to indicate their occupations; however the fact that his father was apparently a close friend of Lieutenant-General Sir John James Hamilton, 1st Baronet (1755–1835) of Woodbrook near Strabane in Ireland, who was a highly respected and experienced officer of the Honourable East India Company, the British and Portuguese Army, there is more than a suspicion that his father made his money as a merchant, trading with the far east but he probably was not a member of the East India Company himself, as he cannot be found in their records and he was settled in Worcester and fathering a number of children before he was beyond the age of thirty. The idea of the family trading is further backed up, by George’s own statement that his elder brother William had died in Surinam in South America on 19 August 1809, because he does not appear to have served with the Royal Navy and therefore was almost certainly there carrying out mercantile operations of some kind. George Woodberry joined the Army slightly late for somebody starting out on a military career, being twenty years old when he was gazetted as an Ensign in the 10th (North Lincolnshire) Regiment of Foot on 16 January 1812 vice (replacing) Ensign E.H. Bulkeley who had resigned his commission. Why George began his military career later than usual for this era, or why he chose a Lincolnshire regiment are still a mystery, although it may well have had something to do with the fact that a Lieutenant Colonel John Potter Hamilton, possibly a relative of General Hamilton, was then serving as a major in the 2nd Battalion of this regiment. George had purchased this rank, the regulation price then being £400, which was no small amount at the time and shows that he clearly came from a moneyed background. It is questionable if George ever actually joined the depot of the 10th Foot, both battalions of the regiment then serving abroad in the Mediterranean; because having gained this first rung on the ladder, George was not slow to exchange into the eminently more fashionable 18th Light Dragoons (Hussars) as a cornet. He exchanged into this regiment after only four months, on 9 April 1812 vice R. Greville who had been promoted. George again purchased this position, the regulation price for a cornet in a line cavalry regiment being no less than £735, although he would have got £400 back by the sale of his ensigncy in the infantry. George’s record on joining the 18th Hussars confirm that he was from Worcester, that he was 21 years old and that he was 5 foot 9 inches (1.75 metres) tall. But George did not stop there in his meteoric rise, because having only served eight months in the hussars, barely time to complete his riding training, he purchased a lieutenancy on 10 December 1812, in the regiment vice Lieutenant Samuel Greathead who had retired. This purchase would have cost a very handsome £997 and 10 Shillings, although he would have received £735 back by the sale of his cornetcy. Purchasing rank, was by no means the only costs incurred in becoming a young hussar officer. The costs of becoming a cavalry officer were astronomical, providing a charger, a second horse and pack horse, saddlery, dress and undress uniforms, a curved 1796 pattern light cavalry sabre and accoutrements as well as a camp equipment suitable for a young gentleman to go on campaign with. Indeed, a board of officers was assembled in 1806 to enquire into the ‘expense attending the equipment of a subaltern officer’ which calculated that it cost a precise sum of £458 to kit a junior officer out appropriately, on top of his purchase costs and that did not include the costs of hiring servants which were deemed ‘almost absolutely necessary’. Therefore George, or more certainly his father, had laid out no less than £55,000 in modern terms to gain his lieutenancy in the cavalry that year. That was not all however! A cornet received pay of £146 per annum and a lieutenant £164 and 5 shillings per annum, this was not adequate to live on comfortably in such an affluent regiment’s mess, indeed it was calculated that an officer required an allowance from his father of no less that £500 a year simply to maintain the standards expected of a subaltern officer! We unfortunately have no statement from George regarding his training, but on 1 January 1813, he began, somewhat reluctantly it would seem, a journal as the regiment began their march from Brighton en route for Portsmouth, having been ordered out to join the army in Portugal. Why was he writing a daily journal? The obvious answer would be, that it was the norm for an officer to retain a journal, almost certainly for their own and their family’s edification in later years rather than with any idea of ever publishing such. However, in George’s case there is the unusual fact that there have existed two versions (with some differences) of the first volume running from January to September 1813, although the one used for the French translation now appears to have been unfortunately lost forever along with the journals which continued on until 1815. Georges Helie does not appear to have known of the second version of the earliest journal, however Peter Hicks has incorporated passages from this second account to fill in the blanks in his revised French version, especially from around the time of the Battle of Vitoria. There has been some confusion as to why two versions of his journals have existed at all, indeed to my knowledge, this is pretty unique. Often roughly written daily journals were tidied up and expanded with a view to publication much later in Victorian times, when there became a national craving to read the journals of the soldiers who had fought in ‘The Great War’. However, George’s journal was not re-written many years later; indeed it can be definitely established, that this ‘fine copy’ was actually transferred from his undoubtedly battered and scruffy daily journal on an almost daily basis, either last thing that evening, or more often, early the following morning before they marched. Why? It can only be because he had promised to send a copy of his journal home, almost certainly this was done at the request of his parents, possibly in lieu of writing letters home, as there is little evidence in his journal that he ever wrote to them, although he often mentions writing to his sweethearts back in England and of course his accountant. The subtle differences in the texts of the two versions are undoubtedly often caused by a little self censorship, (not repeating some of the colourful encounters he had with various women or easing back on descriptions of some of his antics), but he also sometimes changes his statements slightly, presumably based on a fuller knowledge of an incident at a later time. He headed the ‘fine copy’ The Idle Companion of a Young Hussar During the Year 1813. However, what often gives away the different times of writing the two journals are the fact that the French version will say that they are about to march somewhere and then describe what happened on the march on the following day’s entry; whilst the English version will often state that they have made the march and often record what happened on the march on the same day’s entry. Because of this much in the English journal on one date is often stated on the next day’s entry in the French version. It is also clear that at times of extremes, particularly around the time of the Battle of Vitoria, George simply did not have the time to keep up his rough daily journal, hence the French version is silent on these days. As George had to find time to catch up writing his diary, possibly a few days after these events, he only wrote into his ‘fine copy’ and that is why these dates only have an entry in the English version. Occasionally, however, as I have previously said, George says more in the rough journal than went into the fine copy which was to be seen by other eyes. Luckily, we do have the alternative version of this first journal and we are able to enjoy his complete, unedited record of these events by comparing the two versions. It should al so be mentioned, that the fine copy of the journal held by the National Army Museum in inscribed within with the Blount family crest. The Blount family had two branches, one based at Mawley Hall in Shropshire and one at Sodington Hall, Mamble which lies only eight miles north west of Worcester. It is undoubtedly this second branch that knew the Woodberry’s. Walter Blount the 7th Bart had died at the age of only thirty-five in 1803, his son Edward Blount, who was then only eight years old, becoming the 8th Bart and running the estate from his coming of age until his death in 1881. Edward Blount is almost certainly the man who either would have supplied the book to George to record his adventures in, or the book was given to him by the Woodberry family after George sent it home from Spain, and the crest added later. Either way, the Woodberry’s being closely connected to the Blounts is another proof of the high social standing of the family. In summary, in this first ever complete English version of George Woodberry’s journals I have chosen for the January to September period of 1813 to use the more expansive, fine copy, English version of his journal, but where the French version of these journal entries does contain different or fuller descriptions of events I have added this additional information into the text using italics to identify that it is from the alternate source. After September 1813, we unfortunately do not have fine copies of the journal and everything produced is a direct translation of the Helie version of his journal. However, having been able to directly compare the English and French versions of the first journal has allowed me to confirm that they are intrinsically the same account (with minor amendments as detailed above) and that gives me confidence that the remainder of the French account has been faithfully and correctly translated and published by Georges Helie. Obviously, it is far from ideal that this first English version is so heavily reliant on having to translate back from French, a text which has already been translated from the original English. Such double translation is guaranteed to mean that the words George actually wrote in 1814-15 cannot be exactly identical to the words we have produced here and it would be foolish to pretend that it ever could be; but what we can be sure of is that we have maintained the meaning of George’s writing and this happily can be attested to by a close scrutiny of the two versions of the first journal, which actually translated back into very similar language to that he originally used and that the meanings were found to be identical. The reader can therefore feel comfortable that in reading this book, they are able to get a very honest picture of the adventures and scenes that George Woodberry endured in his three years of campaigning on foreign fields. The only changes the editor has made to Geoge Woodberry’s text is some amendment of the punctuation to help the reader follow his meaning and the removal of much unnecessary capitalisation of words which is frankly simply irritating and in no way, alters the meaning. The only other change made is to alter, where known with absolute certainty, the names of places and people to conform with the official spelling to aid the reader in their identification. Where uncertain of a name I have indicated this either by a footnote or simpy by [?] and if part of a word/name is omitted I have added the missing letters in and annotated these in [brackets] to indicate them as my additions for clarity. I have also inserted a great number of footnotes to help explain what or to whom George is referring, these can either be referred to as the reader progresses or ignored to allow George’s story to flow. I have only occasionally given brief statements to guide the reader through the issues/occurrences George occasionally passes by without comment in the text, these additions have been kept to a minimum and are clearly delineated from George’s own text. There are however, two further questions to answer regarding these journals. To the question as to whether George actually continued with the practise of writing up a ‘fine copy’ of the other later journals; the answer is almost certainly, yes, or at least he began to do so. George recounts that he was pleased to send home safely the first ‘fine copy’ of the journal which was now full, with his servant John Ipper in the autumn of 1813. He also mentions that he has another book ready to act as his ‘fine copy’ book for the next period of campaigning, but later he recounts having lost much of his baggage, which undoubtedly would have included this second copy of the journal. At this point, with little opportunity to procure another book to replace this lost ‘fine copy’ of the journal and with George probably not really fancying the chore of re-writing all of the lost section even if he could procure another suitable book, the idea of keeping the second journal going seems to have been shelved permanently and is never mentioned again. So, this explains why there is only one journal in the National Army Museum and why it only covers the first nine months of his campaigns. The other obvious question is why did the full set of rough journals seemingly remained in France, when George left the country when he resigned in 1818, and whereby Georges Helie came to publish them in Paris nearly eighty years later? Unfortunately, George’s journal ends in July 1815, probably because the fighting was now over and the boredom of garrison duties, even though in a delightful part of France, led to George to simply lose interest in recording the mundane, therefore it cannot help in itself. However, it is patently clear from George’s journal, that he was a very young man, virile and adventurous, with a roving eye, but also liable to lose his heart to some attractive young lady on a regular basis, whilst still able to move on to another love, quickly forgetting the former, each time the regiment moved its quarters! During his later years, which will be fully described at the end of his journals, he actually attested in court in 1824 that he had formally converted to Catholicism whilst in France in 1818. It is not too much of a leap into the dark therefore, to suggest that George converted with the aim of marrying some French girl he had met during this period and that the journals were left with her, when the romance fell through and George left finally France, never to return. In fact, it is virtually the only plausible explanation. Having explained the strange and convoluted circumstances regarding George’s various journals, it is with relief that we can now turn to George Woodberry’s service with the Eighteenth Hussars in Spain, France and Belgium. The Eighteenth were basically an Irish regiment, raised in Ireland in 1759, with the Earl of Drogheda as their colonel and many of the men ensliting from that island, but it had no official nomenclature at this time. In early 1813 George embarked with six troops of the 18th Hussars for Portugal and having arrived in Lisbon, where the regiment was brigaded with two further hussar regiments, everything was prepared for their advance to join the Duke of Wellington’s Army, which then lay in their winter cantonments along the Portuguese border, waiting impatiently for spring to arrive when the Anglo/Portuguese army could march into Spain once again and attempt to finally drive the French army out of Spain. The previous year, the Duke of Wellington had wrested – at great human cost – the major border fortresses of Ciudad Rodrigo and Badajoz and had then smashed the French Army in the field at a stunning victory just outside Salamanca. Following up this success, Madrid had been captured and the French had been forced to abandon southern Spain in its entirety. Unfortunately, the year had not ended so happily for the allies, with Wellington failing to capture the minor fortress at Burgos and was eventually chased back out of Spain by superior French forces, a retreat made infinitely worse by the complete breakdown of the supply system, leaving the soldiers to virtually starve, living only on acorns and the occasional stolen livestock – despite the threat of hanging if caught in the act – desperate times requiring desperate measures to survive. Despite this disastrous end to the year’s campaigning, the new year augured in the promise of a great advance, with luck, they would drive the French over the Pyrenees and completely free Spain from their tyranny. The reason there was such optimism in Wellington’s army was primarily based on the fact that news of Napoleon’s Grand Army having perished almost to a man in the snows of Russia that winter was now filtering through to the troops also that the French were rapidly reducing their numbers in Spain to make good their losses in Germany. George and his fellow hussars therefore arrived in Portugal at the perfect time to be fully involved in this new and quite possibly, the pivotal campaign in the whole war. It is now time to let George tell his own story. 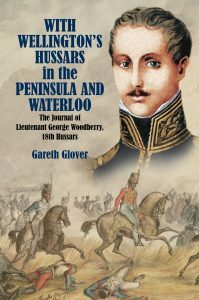 Published in 2001, Eric Hunt had used snippets from the diaries of three hussars to tell the story of the 18th Hussars during the Napoleonic Wars, one of which was George Woodberry’s. He celebrates his twenty-first birthday on 13 April 1813, he must therefore have been born in 1792. Claines is not and never has been a village in its own right, but simply an ecclesiastical parish which encompassed a number of small villages to the north-west of Worcester. Figures from The British Army Against Napoleon page 152. Equivalent to about £18,000 today. Equivalent to approximately £29,000 today. Malet in his history of the regiment does get confused with regard to George Woodberry’s rank in 1813, often referring to him as a Cornet. Equivalent to aapproximately £36,000 today. Equivalent today to around £19,000. Equivalent to approximately £6,000 per annum. Equivalent to approximately £7,500 per annum. Until 1918 the British public had referred to the Napoleonic Wars as ‘The Great War’, until in that year an even more terrible and costly war ended, which was then given that sobriquet, which it retains to this day. Cavalry regiments at this time usually consisted of five squadrons, each of two troops numbering in practise around sixty men per troop, each commanded by a captain or senior lieutenant.